The Good Doctor is widely travelled, and brings back to Portugal many interesting culinary ideas from around the world, using these to complement the traditions of her native land. So when I began to harvest olives from her trees to pickle for the coming year, she looked a little skeptically at the plastic water bottles full of crushed and slit olives and asked me Why don't you make sweet Greek olives? I had never heard of those before, and she could not tell me much about them except that she had bought some in a shop while driving through Greece some years ago, and they were rather good, so she would prefer that I make some of those instead of the usual spiced pickles all the local farmers do. OK, I said, and began to look for information on the Internet. Nothing useful was found in searches using terms in English, German and Portuguese. I found some pages talking about candied olives made from pickled ones, but nothing useful describing the process starting with fresh olives. What to do? I asked a Greek colleague for help, and a few minutes later, she sent me a link to a web page in Greek which describes making sweet olives and olive jam. Gather ripe, dark olives, de-stem and rinse them, then place them in clean one- to two-liter plastic bottles. Fill the bottles with fresh, cold water and cap them. Change the water daily for about two weeks, testing the bitterness of the olives until it is reduced to an acceptable level. The time needed will vary according to the olive variety, the degree of ripeness and your personal taste. The Greek recipe this one is based on suggests four or five days time with daily water changes, but that is simply too little time for my olives and my taste. After the olives are debittered, cut the tops of the plastic bottles to remove the olives. 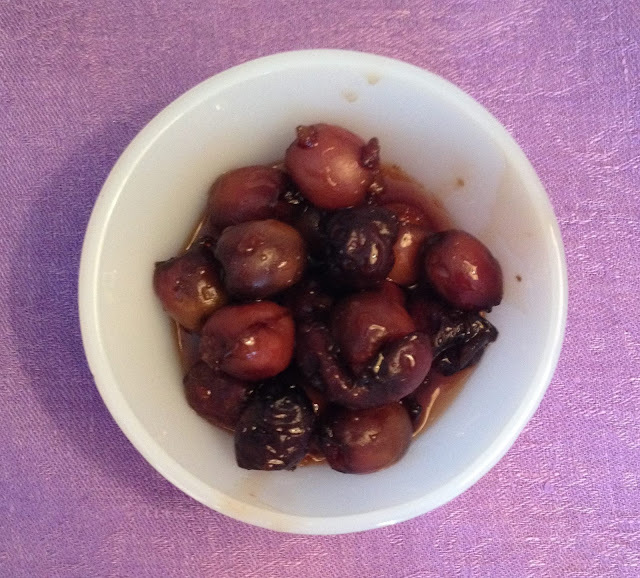 Then use a de-pitter (a descaroçador de cerejas - a cherry pitter - will do the job) to remove the pits from the olives. Weigh the olives and place them in a saucepan or small pot. Add the same weight of water to the pan (so for 600 g of de-pitted olives, add 600 ml water). Add sugar to the pot amounting to 40% of the weight of the olives (which would be 240 g sugar for 600 g olives). Bring to a hard boil on high heat, and let the mixture boil for 20 minutes, with occasional stirring. Then remove from heat and allow to rest overnight. The next day, add more sugar to the pot - 20% of the weight of the olives (so another 120 g of sugar if you are working with 600 g of de-pitted olives). Boil the mixture hard for another 20 minutes until the syrup thickens. Then remove from heat. Can the sweet olives in sterilized jars following the usual hygenic procedures or serve them fresh, warm or cold.